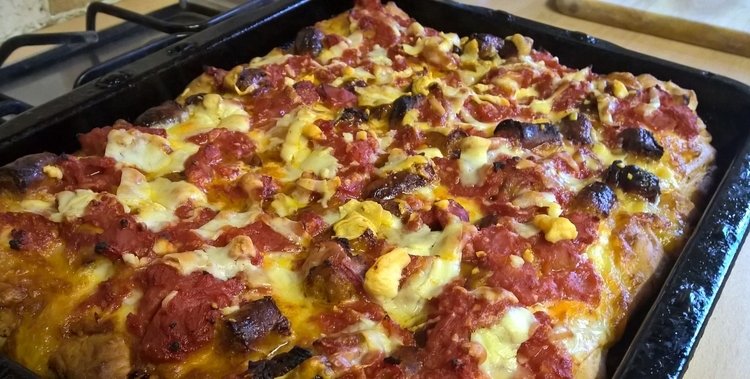 This pizza is cooked right in the pan that the sausages were cooked in, so you end up with a nice tasty bottom, and who doesn’t like a tasty bottom right? If you’re looking for low fat then run away right now, I have nothing for you today. 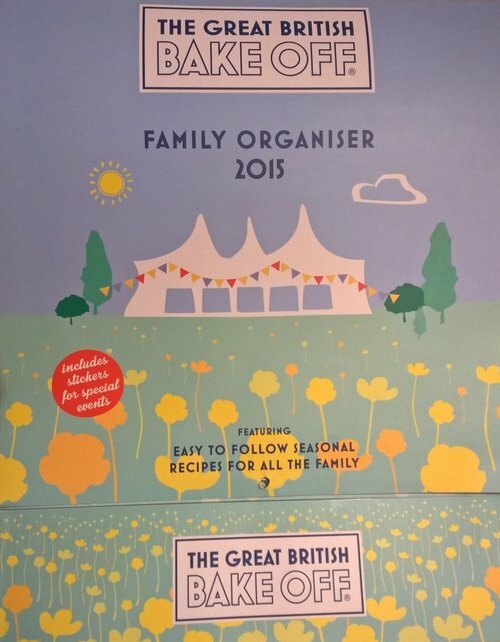 This is the February recipe from my The Great British Bake Off 2015 calender. It’s a substantial pizza which serves 4. There are a couple of things I’d do differently if I made it again, but I’ll come to that at the end. – 50g block pecorino cheese (or parmesan if you can’t get pecorino). 1. Put the flour into the bowl of a mixer with a dough hook. Put the yeast on one side and the salt on the other. Make a well in the centre and pour in the oil and water. Mix for a few minutes until you get a smooth elastic dough. If you don’t have a mixer with a dough hook, then bring it all together by hand in the bowl, turn out onto an oiled counter and knead for about 10 mins until smooth and elastic. 2. Place the dough into an oiled bowl, cover with a piece of oiled cling wrap and leave for about an hour in a warm place. Prepare the topping while the dough is rising. 3. Preheat oven to 200C/400F. Oil a large baking tin, mine is about 35cm x 27cm. Place the sausages in the tin and cook in the oven for about 20 mins, turning once or twice. 4. While the sausages are cooking, tip the canned tomatoes into a sieve over a bowl and leave it to drain the majority of the liquid out, shake it around now and again. 5. Crush the garlic cloves and mix them into the tomatoes. 5. Drain the mozzarella and roughly pull it apart into strips. 6. Using a vegetable peeler, shave the pecorino cheese. 7. When the sausages are cooked, remove them from the tin and keep the tin as it is. Turn the oven up to 220C/425F. Slice up the sausages. 8. When the dough is risen, tip it straight into the tin that the sausages were cooked in. Using your hands stretch it out to the sides, it will keep shrinking back, but persevere. When you’ve done your best, leave it for 10 minutes to relax. Then stretch it a bit more going up the sides of the pan a little too. Bake the dough for 10 minutes. 9. 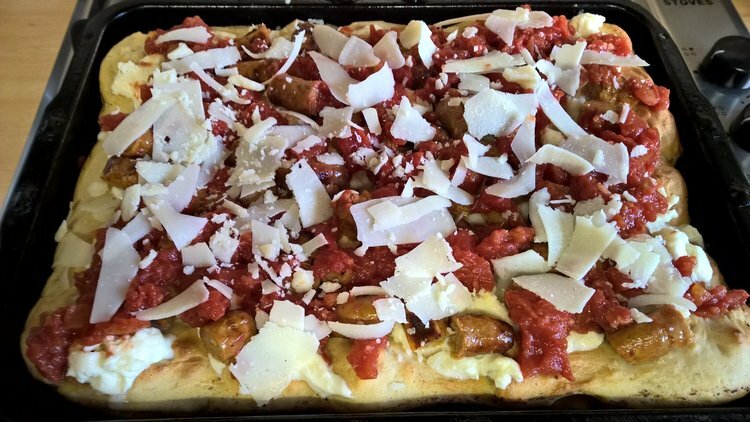 Scatter the mozzarella over the base, then the slices of sausage, then spoon on the tomatoes, and finally the shaved pecorino. 10. Put back in the oven for about 25 minutes until the edges are golden brown and the filling is hot and bubbling. Remove from oven and leave it in the tin for a few minutes before cutting. And voila! I wouldn’t recommend trying to make a vegetarian version of this, or using any alternative to the sausages, because the base really needs to cook in that spicy sausage fat for it to be what it is, otherwise it’s something different, you know? – I would make the canned tomatoes into more of an actual tomato sauce first rather than using them just as they are. Canned tomatoes are a great ingredient but I do think they need some cooking first. – I’d add some herbs on the top, maybe some fresh basil leaves thrown on after cooking. I just feel it needs a bit of green. – I was going to say I’d make a thinner base because I’m more of a thin crust gal, but on second thoughts, this pizza is meant to be deep pan, so I won’t mess with that. So, anyone want a slice? Oh man! And you posted this right at lunch time in Idaho too. Oops! Well hey, we just ate it a couple of hours ago, and there’s still some left, I’ll blog-zap it to you (that’s a thing right?). It should be a thing. It absolutely should be a thing. What a question to ask me. .. who doesn’t love a tasty, spicy, well rounded, with enough meat bottom…. or are we talking about pizza? I think we can talk about both. If you eat lots of pizza then you get lots of meat on your bottom right? Am I younger than you? I’m sure I’m no better at cooking than you, I just happen to post what I cook! Either way I’m happy to adopt you, but you realise that means you’ll have to actually speak to me, in person, right? Sounds delicious even now when I’m taking chemo (I’m not having nausea). How about for the green part, throwing in some cilantro? Hee hee. I usually prefer a thin crust, but this was tasty! 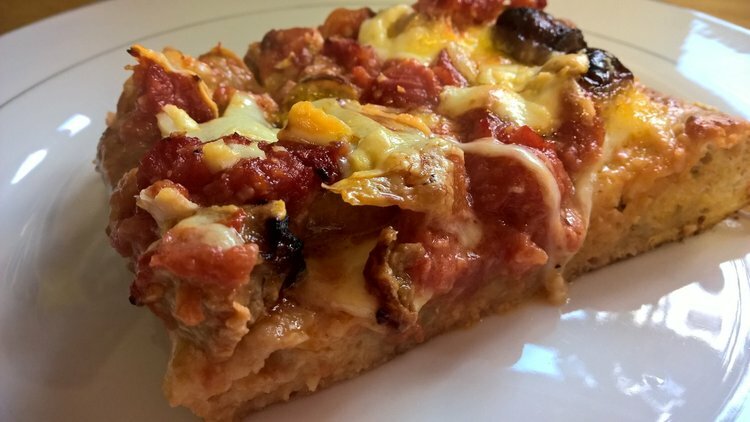 I’m not usually one for sausage on pizza, but this sounds so amazing! It’s the tasty bottom that does it!